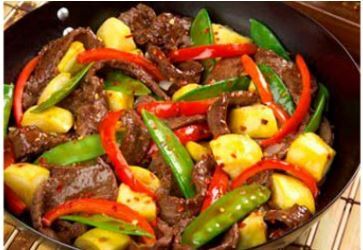 This delicious moose dish is low in fat. The amount of each ingredient is proportional to how many people you’re serving. 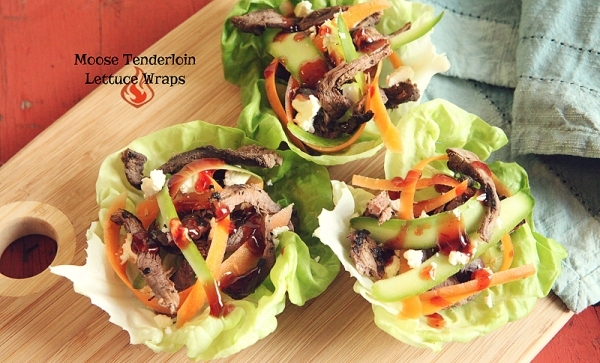 Using half a pound of moose, as this recipe does, makes two large servings. Slice steaks cross grain and marinade in soy sauce for one day. Throw a little oil into a hot wok to avoid sticking. Stir in moose for about 1 minute. Add other ingredients, including seasoning, stirring frequently. Add additional soy sauce to coat all ingredients. Stir in noodles and serve immediately. The traits that separate elite bow hunters from the masses are attention to detail and rigorous training. These are year-round archers, and here’s how they push themselves to become deadly hunters. As creatures of habit, we’re guilty of practicing at distances at which we can comfortably stack arrows in an impressive -fashion—typically 20 yards. However, extending your practice distance well beyond your comfort zone accomplishes several things. First, it forces you to tighten your form, since miscues are multiplied as distance increases. Greater practice distances also force you to identify and correct imperfections lest you continue to splash arrows about the range. This year, if space allows, double your practice comfort zone. You’ll find that when “short” shot opportunities present themselves, they’ll be chip shots. Drawing a bow requires a certain degree of physical strength. Leveling a fiber-optic pin confidently on an animal is difficult, if not impossible, when your arms are trembling uncontrollably. Sadly, archers who pull out their bow a week prior to the season aren’t physically prepared to attempt an ethical bow hunting shot. The right repetition makes you both strong and accurate. Animals rarely present the perfect broadside shot. But how many of us practice any other angle? Whether you shoot a block or a 3D target, practice a variety of shot angles. Shooting non-perpendicular angles adds another physical and mental dimension to the shot execution, because the bull’s-eye changes geometrically. When practicing, move about the range, varying your relationship to the target face until you’re proficient in every possible angle. Many archers think the only way to practice judging distance is with a bow in hand, but the opportunities are everywhere, including grocery stores and parking lots. Mentally measure an object in the distance and pace it off to check your guesstimate. Or stroll through the woods with a rangefinder. Stop occasionally and put an eye on a bush, branch, or rock. Give yourself a few seconds to estimate the real estate, and then check it against the laser. After a few trips, you’ll become amazingly accurate at taping distances with little more than a keen eye. Shot opportunities often present themselves in low light, whether the first or last of the day. Try shooting three or four arrows in this tough light. By doing so, you’ll have a real appreciation for what to expect when visibility is less than ideal in the field. Ground blinds now outsell tree stands, as they offer a portability and versatility that tree stands simply cannot. However, if you’ve never practiced from one, you’ll be unpleasantly surprised when you try to lob a shot from inside its tight confines. Limited drawing distance, extremely small windows (which narrow the shot field), and dark interiors challenge even the best bow hunters. A word to the wise: Pop your ground blind up and practice shooting from it prior to toting it into the field. Accurately judging distance is the first step toward proper shot placement. 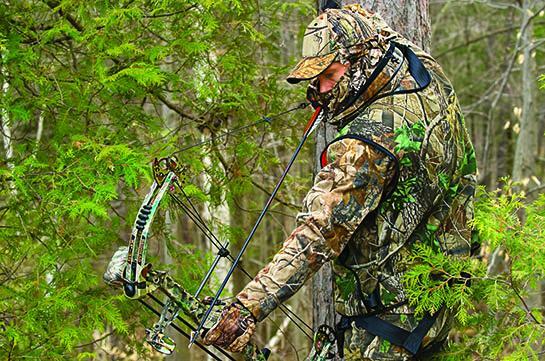 Instinctive or calculated, bowhunters rely on it for close range shooting. Gun hunters count on their ability to estimate longer distances. Over time we all learn our own tricks for calculating distance but with the advent of laser rangefinders many of us won’t leave home without them. Regardless of how you go about it, determining yardage can make or break your hunt. I will remember one hunt as long as I live. The outcome was downright depressing all because I misjudged the distance. It happened 16 years ago. I was a neophyte bowhunter at the time. I’d set up a treestand in a small block of trees that I knew held several bucks and does. The previous winter I’d picked up some huge sheds that taped out at 183 Boone & Crockett inches. Knowing that the gigantic buck had survived the winter, my hopes ran high and I knew there was always a chance he’d show up in the timber I was hunting. As luck would have it 45 minutes after climbing into my stand I heard leaves crunching underfoot. Straining to look through the trees, sure enough a smaller basket rack buck was making his way toward my stand. Always an impressive sight I enjoyed the view as he walked 10 yards from me. Then I heard more rustling in the leaves and looked over to see him. He was nothing short of magnificent! Based on his sheds, it looked like he’d grown at least another 15 inches putting him well into the high 190’s – a buck of a lifetime in anyone’s books! He walked 12 yards from my stand but I couldn’t get to full draw with him in plain view. As soon as he turned I capitalized. At full-draw, I locked my 20 yard pin on his body as he continued to amble forward. Walking straight away there was no shot opportunity at all! By the time he stopped, I estimated he was standing at 30 yards. With all the concentration I could muster, I focused and released. The arrow flew where I’d aimed, in perfect alignment with his chest, but literally inches high splitting the hair on his back! Completely awestruck and in total disbelief, that gut-wrenching feeling overcame me as I watched my world-class archery whitetail bound away never to be seen again… and all because I’d misjudged the distance! Since that day I have made it my lifelong mission to learn how to accurately judge distance. From capitalizing on today’s technologically advanced laser range finding devices to using topographic characteristics to assist in calculating distance, and understanding the influences of terrain, it is an ongoing practice in my world. Regardless of whether you’re an archer or a rifleman, here are a few considerations that might help you as you learn to accurately judge distances. Today’s technology is a saving grace for hunters. Many of us won’t leave home without our laser rangefinder. Portable and easy to use, we simply identify our target, adjust the setting, point, hit the button and, voila! … distance is displayed on the screen. With yardage confirmed, all that remains is the shot itself. When I began bowhunting nearly two decades ago rangefinders had a simple dial that brought the target image into focus when the dial was turned. Wherever the dial ended up, that was your yardage. Today, thanks to innovation, laser rangefinders are readily available and relatively affordable. In fact today there is really no reason not to use a rangefinder. Many manufacturers have their own versions, but in my opinion, one of the latest and greatest inventions is Bushnell’s Laser Arc. I’ve got the Elite 1500 model. The ARC stands for Angle Range Compensation. While traditional rangefinders are precision optical instruments designed to be used on a level plain (line of sight), the ARC rangefinder compensates for angles from a treestand for instance, or up or down a mountain slope. I have owned and used several different kinds of rangefinders over the years. The Laser ARC is my absolute favorite. Using digital technology, it has a built-in inclinometer that displays the exact slope angle from +/- 60º of elevation with +/- 1.0 degree accuracy. Hunters have always struggled with extreme uphill and downhill angles. These severe angles alter true horizontal distance to the target. The ARC solves this problem. It has three primary settings: bow mode, rifle mode, and a regular mode (for line of sight distance calculation only). It has a bow mode that displays line of site distance, degree of elevation, and true horizontal distance from 5-99 yards (or meters). For longer range shooters, it also has a rifle mode that calculates and displays the amount of bullet drop, at the target in inches (or centimeters). In the rifle mode, the amount of bullet drop is determined by the line of sight distance to the target, degree of elevation, along with the specific ballistic characteristics of the caliber and ammunition. As the hunter ranges the target, the line of sight, degree of elevation, and bullet-drop/holdover in inches or centimeters is displayed from 100-800 yards (or meters). Here’s where the technology shines ballistically. In the start-up menu, one of eight ballistic groups can be selected by the user, with each formula representing a given combination of caliber and loads. Laser rangefinding technology, and the ARC system in particular, is invaluable but what if we don’t have one? Then it comes down to a matter of practice and estimation to determine our downrange distances. For most of us, learning to judge distance takes considerable practice. Only by doing it a lot, and under variable conditions, can we become competent at it. Shooting is a lot like golf. Understanding how your bow or gun works (i.e., trajectory and ballistics) and interpreting the size of the target animal relative to the terrain can only be learned through firsthand repetitive experience. So how do we get all this supposed experience when we can only take a finite number of animals each year? The answer lies in visiting the gun or archery range. For bowhunters, nothing beats practice on the 3D course. Today’s 3D targets, like those made by MacKenzie, are very lifelike and offer as realistic practice as you’re likely to get anywhere. Most are made to scale and can be strategically placed in any range situation to simulate realistic hunting scenarios. On my local 3D course, our club uses everything from coyote targets to whitetailed deer, mountain goat, elk, moose, wild hog, turkey and more. Some are set at long distances over 60 yards through wide open clearings while others are placed in the trees, often with very small shooting windows at closer distances like 20 or 30 yards. Most 3D ranges have a good assortment of field scenarios to allow practicing archers to hone their skills. Likewise, rifle and muzzleloader hunters should visit the range regularly to hone shooting skills. Unfortunately due to the expansive nature of bullets today’s 3D targets aren’t an option. Alternatively silhouettes are. Most rifle ranges offer variable range distances from 100 to 400 yards. At my club our furthest distance is 600 yards. Unless you’re really into the long range thing 400 yards is a stretch for most big game hunters. By shooting repeatedly at 100, 200, 300, and 400 yards, we grow accustomed to what those distances look and feel like. By taking note of the size of target in our scope at specified magnifications we can also learn to estimate distances. For example, at 10x zoom on my Leupold scope, I know that a deer will fill a certain percentage of the field of view. By acknowledging how much of the animal is in the field of view, I can guess the approximate yardage with relative accuracy. Likewise, at 200 and 300 yards, that deer will appear smaller respectively. Whether we’re hunting remote regions or in farmland things like trees, rocks, fence posts, and power poles can be used to aid in judging distances. As an archer I’ve learned to make a mental note of things like trees, shrubs, rocks or other physical land-based objects at 10 yard increments out to a distance of 50 yards from where I’m sitting. By burning those objects into my memory I’m better able to make quick decisions when an animal steps into a shooting lane. I’m guessing it may be the same throughout North America but where I do much of my hunting I’ve learned that power poles are set at a standard distance of 100 yards apart. Any time I’m hunting a wide open power line or in farm country I can use those power poles as markers to estimate yardage. As a rule, regardless of what kind of weapon you’re hunting with, breaking distances down into increments simplifies things. Remember, if you’re sitting in a stationary stand or ground blind there is always the option of setting out yardage markers at desirable increments, e.g., every 10 yards. Judging distances on the open prairies is a very different game than judging distance in the dense forest. Likewise, estimating the distance of a large target like a moose can be tricky if you’re more accustomed to looking at antelope. Dense cover and the size of the animal can play tricks on your mind. As an archer, I spend most of my time hunting heavy mixed forest areas comprised of aspens and evergreens. Rarely do I see deer, moose or elk at distances further than 80 yards unless its down a long open cutline or across a clear cut. So, whenever I head out to different states or provinces to hunt smaller species like pronghorn antelope, it usually takes some time to acclimatize and recalibrate my brain to accurately judge distances. In my experience, smaller big game species in open terrain tend to appear further away while larger species under heavy cover often look closer than they really are. Unfortunately there are no set rules here; you just need to figure out what works best for you under variable conditions. Need a Do-Over With Your Shot? It’s rare for any hunter to walk away from a field or reflect on a hunt and not think about whether a shot could have been better. Whether with a bow, crossbow or firearm, there are times when we hesitate. A little voice – instinct, caution, doubt? – throws up a hurdle. Sometimes we adjust and avoid the hurdle. Other times we pull up short and don’t leap. We don’t take the shot.And, unfortunately, there are times when we know the hurdle is there but take the shot anyway. We’re confident in our abilities and that of our bow, crossbow or gun. Some might call that experience. Some might say it’s recklessness or unethical. We probably all can look back and wrestle with at least one shot that might have been risky, even if things turned out well after taking it and the deer, bear or moose is on the ground. Part of our duty as hunters is to strive to maximize our abilities with whatever weapon we use. We practice, tune our bows, hit the range with our guns. We try to find the right combination of arrows and broad heads or the ammunition that works best with our rifles, muzzleloaders, handguns or shotguns. One way to improve our knowledge and experience is with Deer & Deer Hunting’s “Shot Simulator” software. If you’ve ever been curious about where your bullet, slug or arrow has entered a deer’s body and what happened, here’s how to find out. 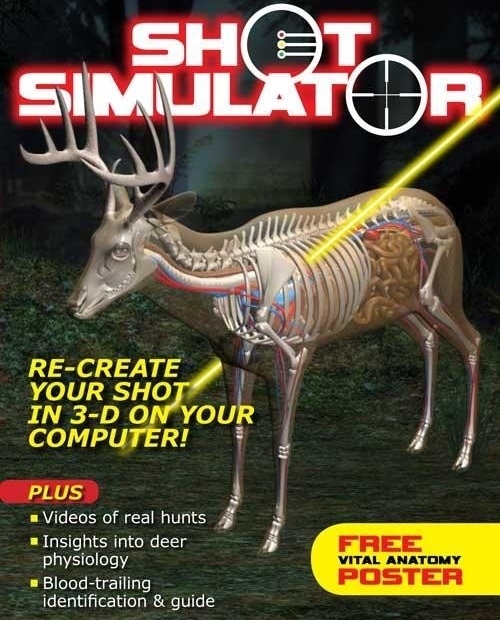 The Shot Simulator software is designed to provide you with outstanding animation of a deer’s body and internal bones, muscles and organs. With the Shot Simulator, you can position the animated deer in numerous positions – how it was when you shot, or how you saw a buck or doe and didn’t shoot – and then learn which organs were hit. Didn’t like what you saw? Position it differently and do it again. You can not only position the deer, but also your shot from a tree stand or ground level. If you’re a stand hunter but only climb about 15 feet, you can see the difference in that height versus 25 feet or on the ground. The animation allows you to move the deer around and then remove the hide, skin and bones to see what happened. Then, you can punch in the trailing guide to find out what happens next. Should you follow the game immediately? Wait a while? Just for your knowledge, you could take the shots on the computer that you’d definitely pass up in real life and then see what would happen. It’s an educational tool that could help you glean more knowledge and help make you a better hunter. Shot Simulator also is a great teaching tool for young hunters, too. They’re curious about what happens and this is a great way to augment their in-field learning. There’s a lot of prep that goes into a moose hunt, so don’t blow a shot at one of these majestic beasts because you can’t call it in. Check out the video below from Ontario Out of Doors for some great tips to help get you ‘in tune’ for when the time comes.